The CedarHurst Trail is 10 km in length. Trail features 200 foot elevation change with low elevation of 1,495 feet and highest elevation of 1,685 feet. 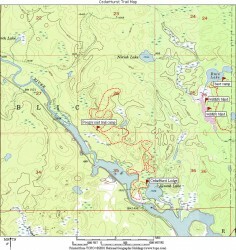 Trail heads are located at both the Lodge and River Cabin. Trail is only open for public use during the ski season. Public Trailhead is located at the North end of the property – please follow the parking (P) signs to trail head parking. Please do not disturb guests at either cabin. Poggie’s mid-trail warming cabin is open and available to all users unless otherwise posted. Winter usage rates are as follows: Daily Pass $5.00, Individual Season Pass $30.00, Family Season Pass $45.00. We had a wonderful time hanging out at the lodge and watching the leaves change colors. Can’t wait to come again. Our first family snowmobile trip. Not sure who had more fun….the kids or the dog. What a beautiful trail behind the cabin…breath taking! We will definitely be back. What a nice weekend! 40 degree temps and cabin was nice and cozy for the four of us. Skied the XC trails twice and did a little snowshoeing. Very nice trail system, you have an awesome property. We’ll definitely be back. Absolutely beautiful time! The cabin is perfect, the weather was wonderful and even shot enough partridge for dinner and to take home! This was our first visit and it was a dream come true. Our niece got married here and I have not been to a more beautiful wedding. The time here made us all realize what life is all about, family friends and the outdoors. We will definitely be back. Love it! As always, a wonderful visit! The small routines and rituals our family has developed during our stays continue to create memories, binding ourselves and friends together. The beauty and serenity of the place heartens and heals. Nice cool weather, good fishing, and relaxing walks, thanks again. Our annual firm retreat gathered at CedarHurst Lodge and had a great time together at this beautiful place in full fall color! We canoed, caught lots of fish (Roy’s walleye the best) refreshed in the sauna/lake and drank wine near the fire. Thank you for everything, it could not have been better! Thank you for letting us enjoy this little side of paradise. Our first vacation in the UP was spectacular and the setting and atmosphere of the Lodge is nothing short of spectacular. Our parting wish is that we have many more opportunities to enjoy this idylic setting. This was the perfect setting for four long-time friends to get together and reconnect. It felt like home the moment we walked through the door. Thank you Chuck for your attention to detail (ski trails & sauna). We hope you have many more people who come here to enjoy this wonderful place. Spectacular weather for skiing! Temps in the 20’s, sunny skies, and no wind in two words, perfect conditions. 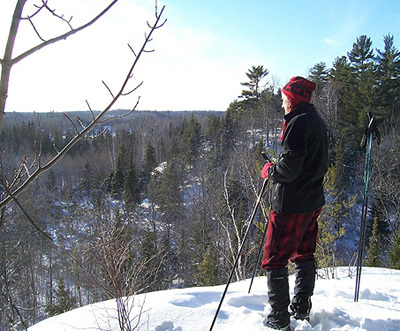 We skiied at Blueberry Ridge one day and the CedarHurst trails one day. We had a truly extraordinary weekend!